The inventor of a ‘smart’ walking stick that could change the lives of millions of Parkinson’s patients has been told she has 14 days to leave the UK after her visa renewal application was rejected by the Home Office – on the grounds of a minor technical fault – which puts her groundbreaking work in jeopardy. Neha Chaudhry, a 24-year-old graduate of the University of the West of England, told Parkinson’s Life there was “a misunderstanding” with a date discrepancy on one of her documents in the 66-page form, which meant that it was rejected. The decision comes eight weeks after her initial application. 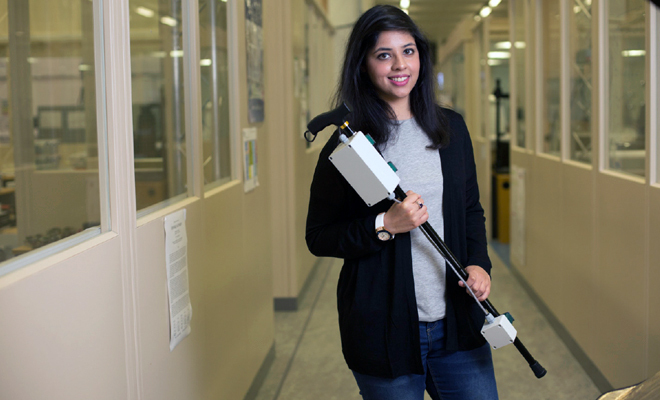 Born in Pakistan, the award-winning inventor has won nearly £100,000 of investment to develop her pioneering walking stick for people with Parkinson’s, which helps prevent a common symptom known as ‘freezing’ of gait – the sudden inability to walk. She has been in the UK since 2010 and began working on the device while studying for her degree in product design technology. The problem with her visa application arose after one of her submitted documents, detailing her status as a director of the company, mistakenly didn’t include a date. Designed to look like a normal walking stick to avoid drawing unwanted attention to the user, the device sends a rhythmic pulse to the handle when it detects a pause in motion. The beat acts as a reminder, encouraging patients to walk and keep pace with it. “I spent three to four months doing research, talking to patients, going to care homes and attending Parkinson’s UK drop-in sessions. More than the disease itself, a big problem is its impact on social lives. Some other products for people with Parkinson’s have a stigma attached to them – they look like products for disabled people,” said Neha in an earlier interview. Around 10 million people have Parkinson’s worldwide. According to the National Parkinson Foundation, 38 per cent of patients fall each year due to freezing, which can happen without warning, anytime and anywhere, and can lead to injury. Inspired by her late grandfather, who experienced freezing and falls because of his Parkinson’s, the student entrepreneur founded her own start-up company, ‘Walk to Beat’, to support the development of the product. 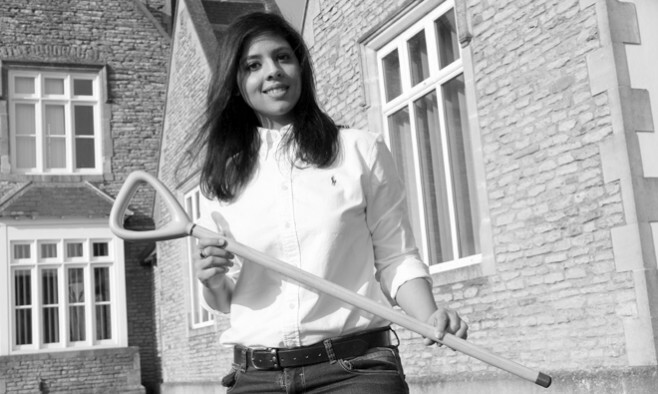 After the walking stick showed so much promise in testing phases, with interest from the NHS and Parkinson’s UK, Neha now feels a duty to the patients to fulfill her work that will improve their quality of life. “When I do this work I’m not doing it for my own good, but for the people who need this,” she said. “I started this work because of my grandfather and when I meet patients, they remind me of him. It is something I can relate to very easily. Neha has appealed the case, which is currently under review by the Home Office. I wanted to comment oh the Jesse Jackson news. Hi Jesse, welcome to the club. Please see your neurologist- movement specialist so he may advise you. I think a positive attitude is essential,and I know you have it, My neurologist advised me to be active & I did. I joined a support group that do exercise 2x a week, the rest of the week I try to exercise on my own, now mostly indoors, with a stationary bike. Best of luck & GOD BLESS.